Two disappointing updates caused shares to tumble. 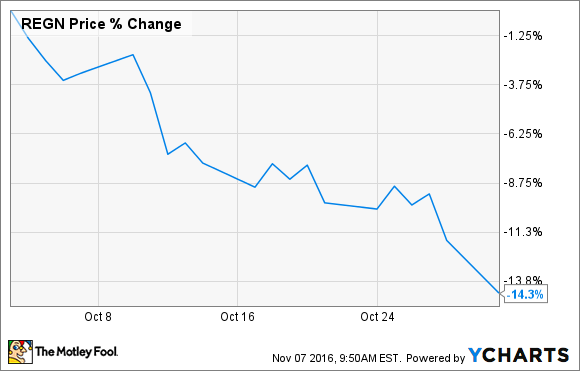 Investors in Regeneron Pharmaceuticals (NASDAQ:REGN) had a rough October. Shares of the biotech giant fell 14.3% during the month, according to data from S&P Global Market Intelligence. Two negative news releases appear to be responsible for the decline. First, Regeneron and its partner Teva Pharmaceuticals (NYSE:TEVA) announced that the FDA placed a clinical hold on a phase 2b study of fasinumab. This compound is a nerve growth factor antibody that is being researched as a potential treatment for osteoarthritis pain and chronic low back pain. The study showed that patients who used the higher doses of fasinumab developed arthropathy, an advanced joint disease. As a result, the FDA has requested that the study's protocol be changed. Second, Regeneron and Sanofi (NASDAQ:SNY) announced that the FDA had rejected their submission for sarilumab for treatment of rheumatoid arthritis. The agency stated that it could not approve the drug because of manufacturing issues that were identified in one of Sanofi's plants in France. Given the setbacks, it is easy to understand why shares dropped by double digits during the month -- especially given the sector-wide downturn. Regeneron and its partners have already announced steps that they will take to rectify both situations. In regard to fasinumab, Regeneron and Teva stated that future studies will exclude any patients who have advanced osteoarthritis and will only administer lower doses of the drug. As a result, both companies still believe that a pathway to regulatory approval still exists. As to sarilumab, Sanofi has already submitted a comprehensive corrective action plan to the FDA and is already working on fixing its manufacturing issues. While Regeneron's management team wasn't yet able to provide an updated timeline, it did confirm that these manufacturing issues will not impact the approval decision, expected in March, of Dupixent, an atopic dermatitis drug. Overall, it wasn't a great month for shareholders, but since both issues appear to be fixable, I think that the long-term bull case for Regeneron is still intact. That's especially true in light of recent news that sales of cholesterol-lowering medicine Praluent are starting to pick up, which is an encouraging sign given the drug's slow start. That positions the company well to post strong growth into 2017 and beyond, so I for one plan on hanging on to my shares.